Travel House is a private residence designed by Brain Factory, covers an area of 75 sq. m. and is located in Rome, Italy. The interior design of the apartment is conceived as an emotional journey, peculiar characteristic of the owners always in looking for new places to explore in the world. At the entrance tall green bamboo from Malaysia rises to the ceiling, positioned strategically in a long architectural cut adorned with white stones on the oak wooden floor. The feeling of being immersed in a bamboo forest is amplified by the optical effect created by the large mirror at full-height. The open floor plan is cozy, colorful and features a texture, black on white, that in drawing the world nominates countries in the different languages. Concealed furniture and invisible doors introduce to the other rooms of the house, carefully designed with elegance. The bedroom is made precious by a bright golden wall, emphasized by the grazing light of the two wall sconces. 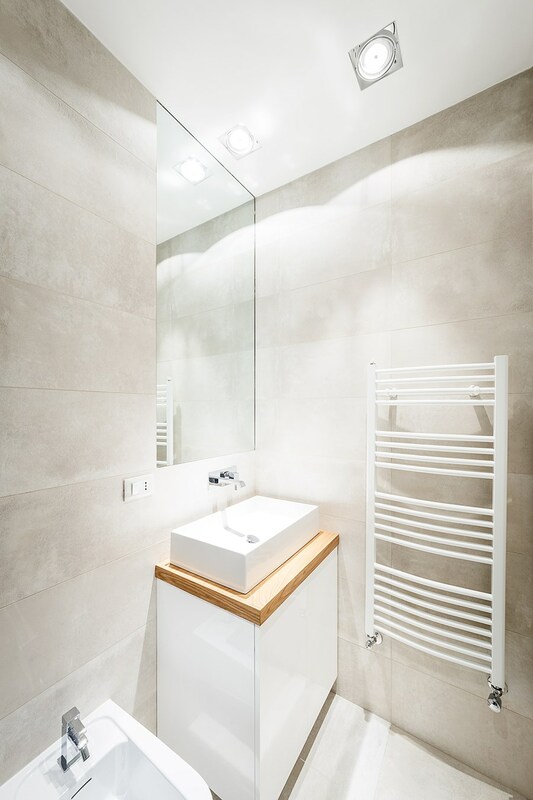 Bathrooms have solutions for comfort and sensorial harmony, through natural materials and plays of transparencies, which are essential for the physical and psychological wellbeing. This entry was posted in apartments, bathroom, bedroom, house, kitchen, living and tagged apartment, bathroom, bedroom, Brain Factory, house idea, houseidea, Italy, kitchen, living, myhouseidea, Rome, Travel House on July 25, 2015 by admin.